I could’ve sworn Alex Bailey was simply Damien Rice in disguise! Of course, I was wrong. This talented singer creates beautiful acoustic folk pop music that’s meshed with a tinge of classical. If you ever enjoyed downtempo, moody music like Damien Rice’s, then this album is definitely right up your alley. Sometimes the similarities are a little too uncanny, but there’s no doubt it’s still great music. Definitely an artist worth checking out as long as you appreciate acoustic folk pop. Melodic and moody quiet folk pop is what best describes Alex Bailey’s sound. This group is actually a whole mix of musicians as well as piano improvisers that perfectly create a blend of folk and classical music. Alex Bailey focuses on creating “ indie music with a focus on songwriting and diverse sound sampling.” If you ever thought modern music and classical music are like oil and water, think again. Although the classical samples are minimal, they do blend flawlessly into one convenient core. 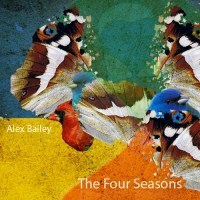 The Four Seasons is the latest offering from this group. It was written and recorded in the Western Ukraine some time in 2009, however, it wasn’t released until June of this year. It’s hard to pick a favorite track from this album. Every single piece has its own unique beauty. The vocal work blends quietly with the simple and low key instrument work. Interjections of classical samples give a touch of variety without really overwhelming the mood of the tracks.